UNITED STATES: 1960s: painting of the Mona Lisa. Portrait painting of a lady. Photo of a lady. Paris, France - November 3, 2017:The authentic ched`oeuvre made by Leonardo da Vinci called Mona Lisa, belonging to the epoch of Italian Renaissance in Louvre. 1980s: School bus, boy lies on wooden plank stretched across seats, paints ceiling, uses paper towels as pillow. Boy pulls down curtain, reveals Mona Lisa painted on ceiling. 1980s: Painting of Mona Lisa. School, boys put away books overhead in lockers, boy talks. 1980s: School bus, children stand, mouths agape, look awestruck, clap, smile, talk. Boy stands under Mona Lisa painted on ceiling, takes off glasses, smiles awkwardly. 1980s: School bus, boys wrestle with bottle of soda, boy removes thumb from opening, soda sprays on Mona Lisa painted on ceiling. Paris, France - July 1, 2017: twilight reflections around Louvre Museum glass pyramid. Louvre palace in the courtyard. 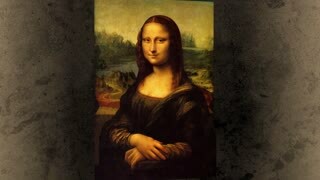 Picture gallery landmark hosting Mona Lisa painting by Leonardo Da Vinci. Aerial top down view of Mona Vale pool. Mona Vale rock pool at sunrise time. Mona Vale pool with the coastline. paintings by famous artists in a video at the end of the video work of Leonardo da Vinci's "Mona Lisa" - "La Gioconda"
The well-known masterpiece made by Leonardo da Vinci called Mona Lisa, belonging to the epoch of Italian Renaissance in Louvre. The world-famous masterpiece painted by Leonardo da Vinci called Mona Lisa, belonging to the period of Italian Renaissance in Louvre. The well-known ched`oeuvre painted by Leonardo da Vinci called Mona Lisa, belonging to the period of Italian Renaissance in Louvre. The well-known masterpiece painted by Leonardo da Vinci called Mona Lisa, belonging to the period of Italian Renaissance in Louvre. The authentic ched`oeuvre made by Leonardo da Vinci called Mona Lisa, belonging to the epoch of Italian Renaissance in Louvre. The well-known masterpiece painted by Leonardo da Vinci called Mona Lisa, belonging to the epoch of Italian Renaissance in Louvre.